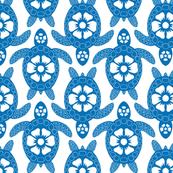 In this earlier post I showed how easy it is to create a seamless repeat in Illustrator. Using a design I created for another contest on Spoonflower, I’ll show how quickly a design can be converted to a half-drop repeat. First, here’s a comparison of a straight repeat (on the left) and a half-drop repeat (on the right). The diagonal movement in the half-drop repeat is created by shifting each repeat unit (one star in the example) vertically by 50 percent compared to its neighbor.